When I returned to the house today to check the traps I'd set yesterday, I was greeted by this surprise. Two rodents in one trap! One rat, and one squirrel. My guess is that the rat went in first, and somehow avoided the trip pan, and then the squirrel came in to take the peanut bait, and tripped the trap. Both critters are rodents, and both live in attics, and both love peanuts and peanut butter. So now I knew that the customer was dealing with two kinds of rodents in the attic, both rats and squirrels. 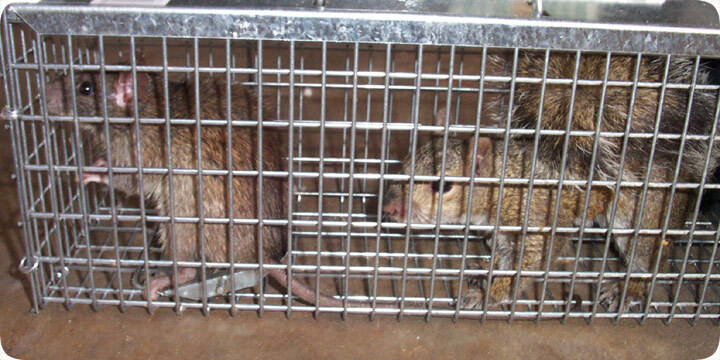 The same types of trapping methods can be used for both types of rodents. I often use snap traps when trapping rats, but never for squirrels. I've never caught a squirrel in a snap trap, and in a case in which both kinds of rodents are sharing the attic, cage trapping is the way to go. The key to trapping rodents in a cage is to set the traps on the pathways the critters use daily, and bait them with rodent favorites, such as peanuts. But far more importantly, all of the entry holes into the house must be sealed, so that the animals are forced out of just a few or one opening. I usually set a special one-way excluder door on these openings, so that the rodents have no way to go but out, and once stuck outside, if they try to get back in, they are easy to catch in cage traps, such as seen above. I rarely relocate rats, but since I always relocate squirrels, I had no choice but to let both of these animals go out in the wilderness.